Bashar Assad's Defiance Points To A Syrian Peace Effort In Tatters : Parallels The Syrian president says he'll take back "every inch" of his ravaged country. It's the latest sign that U.S. efforts to find a diplomatic resolution are failing. Syrian President Bashar Assad addresses parliament in Damascus on Tuesday, saying he will retake "every inch" of Syrian territory. Assad's defiant tone comes at a time when peace efforts for the country have been crumbling. Syrian President Bashar Assad is sounding rather confident these days. In his first major address in the past two months, he promised that his troops will reclaim "every inch" of Syrian territory. 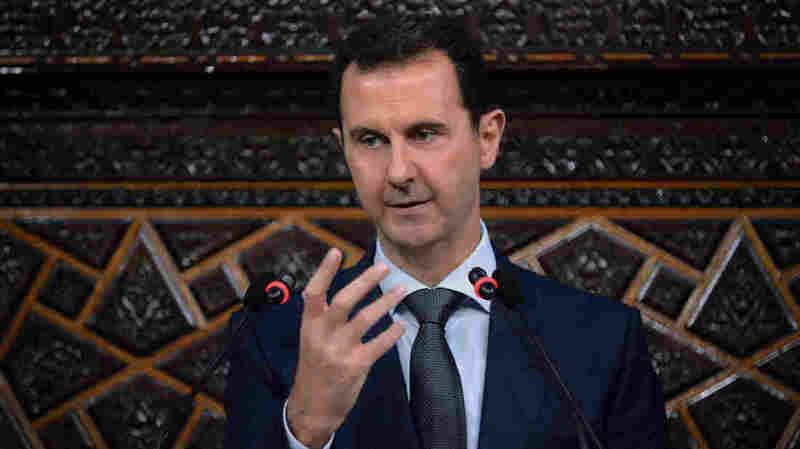 "We have no other choice but to be victorious," Assad told Syria's parliament on Tuesday. He also lashed out at rebels, blaming them for the failure of peace talks backed by the United Nations. Assad's speech is calling into question international diplomacy on Syria. One Syria-watcher at the Atlantic Council in Washington, Faysal Itani, says it's time to go back to the drawing board. "It is safe to say [the peace effort] has failed," Itani tells NPR, saying he never thought the prospects for diplomacy were good. The diplomatic plan relied on Russia and Iran using their influence with Assad to encourage him to agree on a transitional government and make peace with more moderate rebels. U.S. Secretary of State John Kerry, one of the key architects of this approach, was "trying to pull a rabbit out of his hat," according to Itani. While Kerry was seeking concessions from Assad, the military balance of power was turning in favor of the Syrian regime. "The Russians are quite committed to ensuring it stays that way. No one has any incentive to give John Kerry what he's asking for," Itani says. There was a time last year when the Syrian president was in a weaker position on the ground and when Assad admitted that his army couldn't be in "every part of Syrian territory." State Department spokesman Mark Toner called Assad's latest speech "discouraging." "His speech was vintage Assad. He's been in this for over five years. He's carried out horrific violence against his own people. So it is not surprising that he's fully committed to what he believes is a military victory. That said, there is no military solution here," Toner said Wednesday. The Syrian government and military continue to block aid to hundreds of thousands of increasingly desperate Syrian citizens. The U.N. has been seeking access to 17 rebel-held areas that are surrounded by Syrian government forces and their allies. Kerry and his counterparts from Russia, Iran and other countries involved in Syria had set a June 1 deadline for Syria to open up aid routes or accept air deliveries of food and other supplies. U.N. officials say they need Syria's cooperation for that, too, and aid workers say airdrops, when helicopters bring in supplies, are riskier and less efficient than ground operations. "What is clear is that there are too many hurdles, too many processes, through which the U.N. and its humanitarian partners need to jump through to get aid to those who need it," says U.N. spokesman Stephane Dujarric. "We shouldn't be in a position to have to negotiate for every convoy. We shouldn't be in a position to have to negotiate the exfiltration of people, who are wounded in hard to reach and besieged areas," he said at the U.N. The United Nations also says there's an uptick of violence in Aleppo, where hundreds of civilians, including children, have been killed recently. The U.S. accuses the Syrian air force of targeting several hospitals in Aleppo, calling those operations "unconscionable." Fighting in and around Aleppo has left in tatters a cease-fire the U.S., Iran, Russia and others backed on paper. The State Department, though, doesn't sound ready for any plan B. "We still believe that Russia, that Iran, can at least appeal to those in the regime who still have influence on [Assad] to refrain from letting this political process, this cessation of hostilities, fall completely apart," Toner said.